gThankYou is a leader in easy, affordable and meaningful employee gifts. 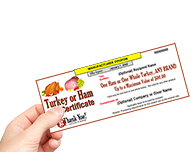 We are best known for America’s favorite Turkey Gift Certificates and Turkey Or Ham Gift Certificates which are redeemed for any Brand, at virtually any Grocery Store in the U.S.
gThankYou was founded in 2007 by Rick Kiley, a veteran of Fortune® 500 companies, high-tech start-ups and an entrepreneur. In the food industry, Rick learned first-hand the universal appeal of a thoughtful gift of food. He’s passionate about great customer service and building engaged, inspired and successful workplace cultures. Rick founded gThankYou to give employers a meaningful, easy way to celebrate employees, the foundation of any great workplace. The gThankYou! Team is dedicated to giving all employers a convenient way to recognize employees with appreciated, practical gifts the whole family can enjoy. gThankYou is dedicated to helping organizations celebrate and say “thank you” to valued employees, customers and clients – holiday time or anytime. We believe happy workplaces are successful workplaces. Research shows sharing gratitude in the workplace builds overall health, happiness, community and increased productivity and profits. That’s why we’re committed to helping company leaders build vibrant cultures of engagement and gratitude. We offer gThankYou! Certificates of Gratitude in a range of varieties and price points to fit most workplace needs and budgets. gThankYou is dedicated to sharing its message of workplace gratitude by offering free resources and a blog full of best-practice thinking. “Celebrating Work” publishes insights, inspiration and up-to-date thinking about building great workplace cultures. We welcome you to download, subscribe, share and join the conversation! Share your “thank you” today and you’ll not only make colleagues feel valued and loyal, you’ll inspire a chain of gratitude in your workplace that can develop into a superior workforce, more profits and more fun. Why wait?